Zonesleep were kind enough to send me out a mattress topper and a pillow to try out and review for The Dozy Owl. And I’m pleased to say it was awesome! Some really great products, a comfortable pillow and an excellent topper. Zonesleep are a UK based company who specialize in making bedding products made from their unique 3D spacer material. It was founded by Tim Stokes who has had over a decade of experience managing a textile company and brought the 3D spacer material to the world of bedding. Now I’m sure you’re wondering what this 3D spacer material is. Well, I was hadn’t heard of it either but the best way to describe it is a sturdy 3D mesh. I’ve got a picture below but it was quite hard to photograph. 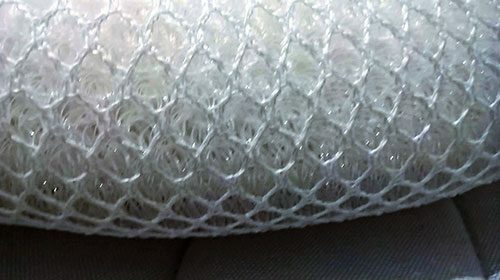 This mesh is firm to the touch but when you lie on it it’s got some good give making it firmer than memory foam but just as supportive. The Zonesleep topper is really great because it has loads of the advantages of memory foam without the disadvantages. More breathable – The 3d spacing makes it much more breathable than memory foam. Traditional memory foam traps a lot of heat inside of it which can really ruin your sleep if you’re already prone to overheating. Lightweight – The 3d spacer is really lightweight which makes putting it on the bed a lot easier and you feel the lightness when you lie on top of it. Washable – Not easily because it’s quite big so you’ll have to take it to a laundry with oversize washing machines but it is washable. I’ve slept on top of the Zonesleep topper for about a week now and I absolutely love it! I’m a very warm sleeper and often get quite sweaty but I’ve been sleeping comfortably all week now and couldn’t be happier. It feels nice and squishy but there’s a definite firmness to it. Firmer than memory foam and it’s about 1.5 inches thick so the firmness works well keeping you supported alongside your mattress. If you were looking for a comfort upgrade on an old mattress this would be great. It fits nicely on the bed and there’s no bumpy edge that you can feel through the sheet which is great. You sometimes get quite a firm edge with mattress toppers so that’s really nice. A Great Choice For Hot Sleepers, it’s really breathable making it the ideal choice for hot sleepers. I’m a hot sleeper and loved it. People with back problems, if you have a sore back at all you’ll find this gives you great support. People who don’t like memory foam, if you’re looking for a comfort upgrade but don’t like the feel of memory foam you’re in luck. I really, really, liked the breathability, that was a huge plus for me and definitely my favourite part. But I also just liked the general feel and comfort it gave the bed. It’s not the thickest, but it’s still plenty thick enough to really upgrade the comfort levels of your bed. Well when I manage to steal the pillow back from my wife who’s side of the bed it keeps mysteriously migrating too I love it! Super comfortable, very supportive and you only need one, two pillows would push your neck too high up I think. It feels downright heavenly, super soft and squishy but there’s enough push back to give your head the support it needs. Again it’s as breathable as the topper is, so no waking up with a sweaty head. This means it stays quite cool to the touch as well which is nice, it keeps it fresh. Back & Side Sleepers will love it, front sleepers not so much because it’s a little tall for that. I personally go between back and side sleeping and was comfortable all through the night. No need to wake up and squash it back into sleep. How plump it is! It’s just so plump and fluffy feeling that it’s hard to take my head off it in the morning. Also that you only need one on your side of the bed, it’s just great. Nothing! I can’t think of a single thing I didn’t like, a really great pillow. I have looked at these Sleepzone mattress toppers before and never bought one because thought they were a bit pricey. I did think I would try a pillow but again, never got round to it. It sounds like the pillow might be a little too thick for me. I have a memory foam one at present that is about 4″ deep. 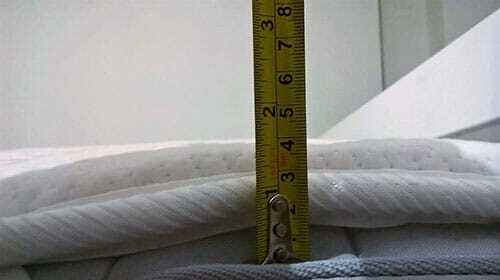 I know that a pillow should not be higher than the measurement of your shoulder from neck across to shoulder. What depth is this pillow? I have a back condition called Spondylosis which is wear and tear of the discs and facet joints. Our bed is now just 8 years old so the thought of having to go bed shopping again is not something I relish. I think our Harrison mattress had a 10 year guarantee so maybe can make it last a fit longer if I get a nice mattress topper. I guess you would recommend the Sleepzone? Can you return them if you don’t like it? The pillow is 4 inches thick but it will squash down much more than a memory foam pillow so it squashes down to around 2 inches but that’ll vary. If you’re interested in the Sleepzone I can tell you it is very comfortable, alternatively, I have some other recommendations which you can find here https://thedozyowl.co.uk/mattress-topper/. And finally, Zone sleep have a 10-day money back guarantee where you can return it and get a full refund, outside that you can return it but have to pay a £25 fee to do so. 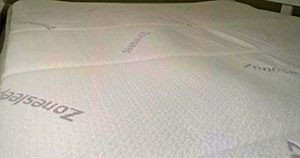 You can buy the Zonesleep topper at: https://zonesleep.co.uk/product/zonesleep-mattress-topper/ or check out some other toppers here.